Every establishment is aware of the importance of id cards and for this reason, our best ID card printer review 2011 presents different brands of devices that can provide this requirement. Id cards offer simple information like the name of school, student and grade level or it may provide the name of a company, the person’s name and department he is working for. Some ids are single sided. On the other hand, other ids have dual sided printing for more information to fit. This review also include additional features such as magnetic stripes to provide access to certain institutions. This is, usually, present in membership clubs, banks, organizations or companies that are particular with security. This prevents unauthorized people from entering the facilities and, so, these ids serve as a protection, as well. Fargo DTC4500 Duplex ID Card Printer is ideal for organizations that need high volume printing of id cards. It is reliable in printing high quality id cards at fast speeds. It is versatile in its ability to print various types of cards all at one time. It, also, comes with a dual input card hopper with a space that is good for 200 cards. This printer is ideal for student id cards, employee badges, security control access and membership cards, among others. It produces printouts with sharp text , clear and vibrant color images. It comes with a built-in Ethernet connectivity that makes it accessible to other users from different locations. With the option to upgrade on features, Fargo DTC4500 Duplex ID Card Printer is capable of dual sided printing that allows more information on ids. Aside from this, magnetic stripes can be added. 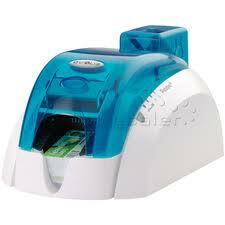 Furthermore, it can allow lamination of id cards to protect them from the usual wear and tear. Evolis Pebble 4 ID Card Printer id the device you can consider for single sided printing of school ids, employee badges, transport passes, loyalty cards and others. It is convenient to use with its 100 card automatic feeder that eliminates the need for reloading every now and then. However, the user has the option to use the manual feeder since it is nice to work with this elegant printer that comes in three attractive translucent colors that can be interchanged: Ocean Blue, Jungle Green and Fire Red. This user friendly printer is compatible with Windows, Mac and Linux operating systems. Magicard Tango 2e ID Card Printer is a double sided id card printer that is preferred by many users for security access. It produces high quality images and gives the option to add personalized HoloKote watermark protection. With this printer, the user can encode on magnetic stripe cards and smart cards. This printer comes with a 300 dpi resolution on edge to edge printing. It is compatible with Windows 7, XP and Vista (32 bit). It has Ethernet, USB and Parallel interfaces. Zebra / Eltron P330i Card Printer is a user friendly, single sided, full color id card printer that is reliable and affordable. It comes with a LCD. It has a 100 card capacity input hopper and an optional 220 card capacity input hopper for high volume printing. It has USB connectivity and an optional Ethernet capability. This printer is ideal for school ids, employee badges, loyalty cards, membership cards, personalized gift cards and customized ATM or bank cards. Top ID card printers such as the Fargo DTC4500 Duplex ID Card Printer, Evolis Pebble 4 ID Card Printer, Magicard Tango 2e ID Card Printer, and the Zebra / Eltron P330i Card Printer are reliable in providing the id cards that serve as a person’s recognition with the clear print of detailed information and vivid picture. It, likewise, provides access to certain establishments.